Home / Asides / Purple rain: did Homer think the wine-dark sea was burgundy? Basic Color Terms: Their Universality and Evolution – book by Brent Berlin and Paul Kay on amazon. I read the first two articles about a year ago, and found them intriguing but thought that both were lacking the context to make them more momentous than mere anecdotes. Now the research-blogging site EmpiricalZeal.com has visited the same arena, exploring the topic with primary scientific sources and experimental results that literally separate language bias from the discussion. Lastly – a source I located after embarking on this article of mine – an entire book seems to lay out the details of colors in language with confident conclusions. What does this all lead me to conclude? While past and current languages may not describe “all” the same colors as English would posit exist, this provably not due to a genetic limitation of that language’s speakers, nor are those individuals unable to perceive a difference between those colors. Language does provide a small boost in telling the difference between colors, though. Here are my favorite selections from these online sources. In the quotes below, I’ve added emphasis, [comments or clarifications,] and … deleted segments whenever I wanted to. In my own writing here, because of the extensive American use of the word colour, I’ve reverted to American spelling rather than my more recent Canadian spelling. This college author muses whether retinas had not yet evolved, at the time of Homer, to perceive the same color categories as named today in English. Certainly the use of color in Homer’s recorded writing does not match with English’s descriptions today. Or perhaps it’s a question of the language not yet having developed distinctions amongst what we today describe as colors in English. When read on its own, this essay presents some interesting factoids and speculations, strongly fed by ancient Greek literature… but doesn’t quite lead me to an interesting new place mentally.. In his writings Homer surprises us by his use of color. His color descriptive palate was limited to metallic colors, black, white, yellowish green and purplish red, and those colors he often used oddly, leaving us with some questions as to his actual ability to see colors properly (1). He calls the sky “bronze” and the sea and sheep as the color of wine, he applies the adjective chloros (meaning green with our understanding) to honey, and a nightingale (2). Chloros is not the only color that Homer uses in this unusual way. He also uses kyanos oddly, “Hector was dragged, his kyanos hair was falling about him” (3). Here it would seem, to our understanding, that Hector’s hair was blue as we associate the term kyanos with the semi-precious stone lapis lazuli, in our thinking kyanos means cyan (4)…. It is possible, in light of evolutionary theory, that the retina of the Ancient Greek was not evolved to the point of full color perception. Different mammals have varying degrees of color vision and eyes are especially prone to mutation. But besides this evolutionary question there is the question of consciousness, the question of the brain and language in relation to color perception. This color vision particularity could have been caused by a lack of visual consciousness that would lead to the creation of new words that were needed to explain a visual phenomenon. This inability to perceive something because of linguistic restriction is called linguistic relativity (7). Because the Ancient Greeks were not really conscious of seeing, and did not have the words to describe what they unconsciously saw, they simply did not see the full spectrum of color, they were limited by linguistic relativity. The color spectrum aside, it remains to explain the loose and unconventional application of Homer and other’s limited color descriptions, for an answer we look to the work of Eleanor Irwin. In her work, Irwin suggests that besides perceiving less chromatic distinction, the Ancient Greeks perceived less division between color, texture, and shadow, chroma may have been difficult for them to isolate (8). For the Ancient Greeks, the term chloros has been suggested to mean moistness, fluidity, freshness and living (9). It also seems likely that Ancient Greek perception of color was influenced by the qualities that they associated with colors, for instance the different temperaments being associated with colors probably affected the way they applied color descriptions to things. They didn’t simply see color as a surface, they saw it as a spirited thing and the word to describe it was often fittingly applied as an adjective meaning something related to the color itself but different from the simplicity of a refined color. That is no pink: what color are that sash and bonnet? A brief article at io9.com covers the same territory of ancient Greece and then more confidently separates out the role of language/culture in perception and naming of colors. At the time this [girl] was painted, over 200 years ago, [the bonnet] would have been considered yellow. Colors aren’t as eternal as we imagine them to be. The way our cultures perceive colors changes over time, just like everything else. To add insult to injury, this painting is called Pinkie. The girl with the pink sash in the painting is called Pinkie because she was small. Her grandmother called her “Pinkie” because of her diminutive size. It refers to the pinkie finger of a hand. To be fair, it’s possible that the sash was called ‘pink,’ because the girl was painted in the late 1700s. Some experts, however, disagree. They say the color of the sash was called ‘rose.’ The term ‘pinke’ or ‘pink’ in the 1600s and early 1700s was used to describe a yellowish pigment. This article from Empirical Zeal is heavy on primary source research, great images, and a fascinating 8-minute video segment. Basically, this is the article that inspired me to share all this color talk in my own article. The researchers found that there is a real, measurable difference in how we perform on these two tasks. 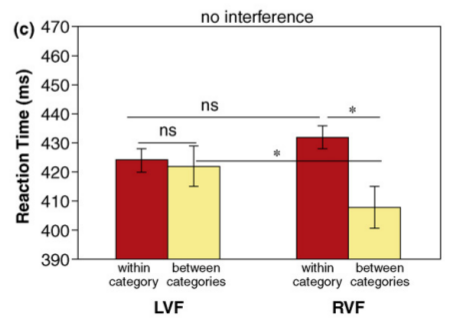 It takes less time to identify [an] odd colored square if you are jumping categories (blue versus green), compared to staying with a category (green versus green). This makes sense to anyone who’s ever tried looking for a tennis ball in the grass. It’s not that hard, but I’d rather the ball be blue. However, and this is where things start to get a bit odd, this result only holds if the differently colored square was in the right half of the circle. If it was in the left half, then there’s no difference between the two cases – blue and green are just as vivid. It seems that color categories only matter in the right half of your visual field! … The conclusion is that language is somehow enhancing your left brain’s ability to discern different colors with different names. Cultural forces alter our perception in ever so subtle a way, by gently tugging our visual leanings in different directions. This book reads a little dry in the segments amazon deigned to share with me, but it promises a thorough exploration of a fascinating topic. … a total universal [or let’s say ‘human’?] inventory of exactly eleven basic color categories exists from which the eleven or fewer basic color terms of any given language are always drawn. The eleven basic color categories are white, black, red, green, yellow, blue, brown, purple, pink, orange, and grey. All languages contain terms for white and black. If a language contains three terns, then it contains a term for red. I bet that reading this book would provide a guess at how many color terms the ancient Greek language really had.